We are pretty spoilt for choice when it comes to global cuisine in Canberra. We are a multicultural city and our collective love of food is reflected in the large number and variety of restaurants we have to choose from. Personally, my favourite changes every day of the week, but there is one cuisine that I am always keen for no matter what day it is, and that is Thai. Thai food is always a winner and this week I am looking for Canberra’s best. 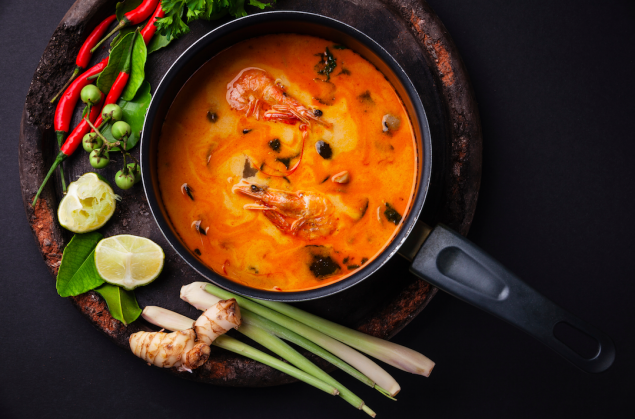 Whether you’re in the mood for a lighter noodle dish like the ever-popular Pad Thai or prefer a more hearty Massaman curry, Thai cuisine has everyone covered no matter the time of day, the weather or what your tastebuds are craving. So tell me Canberra, who serves up the best Thai food in town? i went with my crew to lemon grass earlier for thai. This is the preferred choice of people on the NY subway, too! Checked Thip’s out last night. Good indeed. Best Pad Thai I’ve had in Canberra. Excellent, well-spiced, fried chicken as well. I’ll be back. Baitong – down the side of Cooleman Court – very tasty. I had a great meal at Thirst in West Row a while back. I don’t work in Civic any longer or otherwise I would head back in a flash for lunch. I agree that Thirst does great Thai meals. It is the only Thai place I go to regularly and it is always worth checking out the specials blackboard. Absolutely best one is Soi-8 Thai at the Griffith shops. Really good value, fabulous freshness. I agree there’s not many good ones in Canberra. +1 for Soi-8 at Griffith shops, and as others have said, Thai Chiang Rai at Kingston. Morks is great for ‘contemporary’ Thai, but in terms of non-fancy Thai food, the only place in Canberra that is really authentic is Thip’s Thai in the Belconnen Churches Centre. It’s a basic hole-in-the-wall, and was recommended to me by a friend with the Thai Embassy. The majority of Thai restaurants here are boring, with dishes smothered in generic salty sauce, and lacking fragrant herbs and chilli. Good to hear the Embassy folk recommendation. I will be checking Thip’s out. Far and away the best Thai I’ve had in Canberra is at Soi 8 at Griffith shops. Okey dokey, well we booked a table at thai herb last night and headed over there around 6pm. Because I was picking up friends on the other side of Amaroo we decided to double back to Harrison via horse park drive, ouch what a pain. We couldn’t turn right across bumper to bumper traffic. Note to self, use Flemington road or find some traffic lights. Anyway we arrived albeit a tad late, and found a sign to the back carpark entrance. Once parked we had some trouble finding the restaurant as we had never been there before and looked like it was tucked away amongst residential flats. With a little bit of walking around some flats, we found it facing Flemington road. All good. So we headed up to the entrance and was greeted by a very friendly waitress who opened the door and welcomed us inside. Very nice considering it was a chilly night, the air inside the restaurant was perfect. I must say first impressions, wow, this is so much nicer than the webpage. It looks brand new, with high end fit out high ceilings modern decor and great pendant lights. It really had a sophistication about it. The table were well spread out and the atmosphere was great. Service was timely and tailored, as we had a small child with the group, the staff were more than accomodating with providing children cutlery, grayons, and small bowls and cups. Thankyou. First look at the menu and it was very comprehensive. A lot of choice and well priced. We ordered satay sticks satay Gai, thai style wontons grow tore and tempura prawns going tempura. Ice cream for the youngin as requested. Drinks, ice cream and entree arrived in no time at all. Fantastic presentation, fresh and tasty, wow, this is going great. For mains we ordered pad med Ma mount king prawn cashew stir fry, Penang chicken curry and a mild mussarmum curry. We also ordered sides of chicken fried rice. Once again, quickly served, great presentation and amazing taste. The atmosphere was very pleasant, the place was packed and I noticed several people turned away due to no reservation, for a Wednesday night I am thinking thai herb is doing something right. There was a small line up of eager customers keen to grab a seat. +1 for Joe’s Thai Food at Wanniassa shops. It’s no longer a secret though, which is good for them but bad for regulars who’ve been enjoying the place untroubled by inconveniences such as having to book a table. Don’t get me wrong, I’m sure no one begrudges them their success. We used to be regular customers of Sukathai at Yarralumla Shops. Whilst the food was tasty, the servings were getting smaller and smaller – A bit too much cabbage “filler” in their Take Away containers. Thai Amarin in Erindale is the best!! Thai Alice in the city was good too… Before it burnt down ???? I love Lemongrass Thai in Civic – 38 chicken (Gang Dang Fug Thong) and coconut rice is my death row meal I adore it oh-so-much. Hi all, I am heading over to Amaroo for dinner with friends tonight, thinking of grabbing some thai, should I give thai herb in Harrison a try or is there something closer to Amaroo that’s good. There are a few at the Gungahlin Marketplace but they are not as good as the one in Harrison. Canberra Curry Festival Chilli Eating Competition is back!